There is a big difference between the most efficient solar panel you can buy and the most efficient solar panel you should buy. Before we get into whether you really want the most efficient panel, let’s define efficiency in the technical sense and the practical sense. The technical efficiency of a solar module is simply how much power it can produce in a given area. Panels are rated based on DC power at standard test conditions, also known as DC-STC. This rating takes the individual solar cell output and divides it by the solar radiation input at test conditions (which assumes 1000 watts per square meter of sunlight at 25ºC. The practical efficiency takes into account factors like panel rating, module size, and installed cost to get the most value from a solar energy system purchase decision. What most people really want to know is how they can get the most value from their solar panels. In that case, we are talking about practical solar panel efficiency, because what you really care about is how much are you going to spend relative to how much electricity is produced over time. To better explain technical solar panel efficiency, see below. This shows two popular solar panels specifications. They are very close in total size, but the efficiency of these panels differs greatly. The cell efficiency of panels only tells you part of the story. The panel on the right claims cells that are over 25% more efficient than the panel on the left. When you look at the actual physical dimensions of the frame, the panel on the right is about 23% more efficient. So in the same area, the panel on the right is capable of 345W output, which is 23% more than the panel on the left. That sounds wonderful, right? You definitely want the panel on the right, don’t you? Not so fast… you need to look at what the different panels cost. What if I told you that the panels on the right cost twice as much as the panels on the left? Unless you had limited space and a mission critical need for maximum power in a given space, you would be crazy to invest in the more efficient panel! The total installed price differences in reality are much less. A complete solar energy system using the panel on the right, installed, goes for about a 30% premium. That’s more than the 23% greater rated power, so all else being equal you would not want to invest in the higher rated panel. There are other nuances and features that come into play, including lifetime power output, warranty, inverter technology options, monitoring systems, and others. The decision on which solar panel to select ultimately has more factors involved that are not related to efficiency. Looking at two identically rated systems below, you can see that it takes about 23% more space to accommodate the same system rating with the panel on the left. 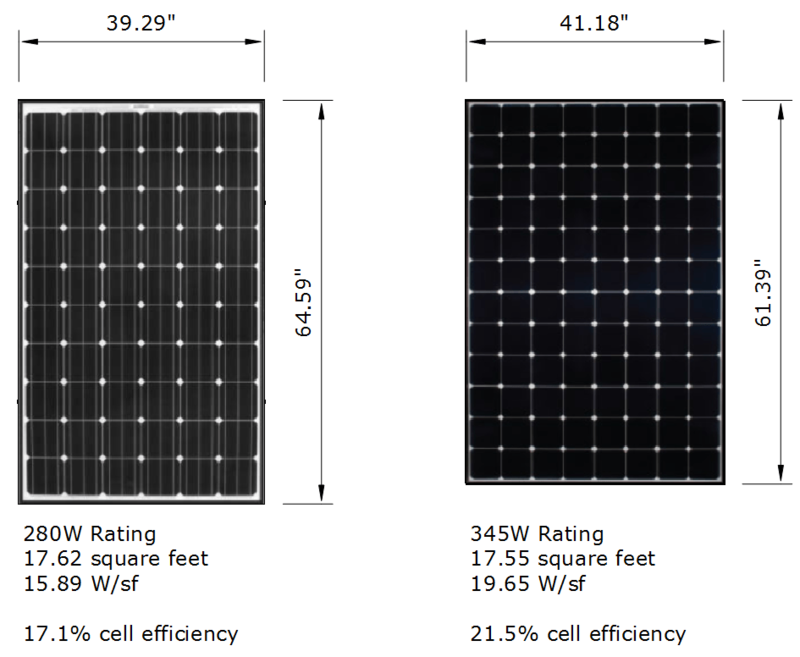 You would need 69 panels rated at 280W to get the same system rating as 56 panels rated at 345W. Note that the watts per square foot is a bit less than above because there is space between each solar panel. Another way to look at it is how much more power you can get in a given area. Below we see that in the same amount of space, we can get 23% more power rating in the same amount of space with the panels on the right. Your takeaway here should be that the physical size and output of a solar photovoltaic panel is only part of the efficiency puzzle. What is most important for the average buyer is the practical efficiency of solar panels or put another way, the cost efficiency. Looking at the manufacturer’s claimed “panel efficiency” or “cell efficiency” is very misleading for practical purposes. If we are sending solar panels into space or have an otherwise very limited area available for solar panels, then by all means we should consider the technical efficiency of the panel, and consider other factors like weight. However, for most people, panel efficiency ratings are overblown. You should rely on your trusted solar dealer to seek out the best value for you. Good dealers will look at the overall factors involved in making a purchase decision and steer you into a brand that they can offer for a good price. Depending on the distribution network, you may find that one dealer offers panels with slightly different panel ratings or efficiency. That is often because their dealer cost on a particular solar panel may be more competitive based on their distribution network, freight costs, volume, and other factors. That doesn’t mean that one brand or dealer is better than the other — it just means that each dealer has found the “sweet spot” for a good balance between efficiency, power rating, and price. Since panel ratings and offerings are changing very frequently, the best bang for your buck is a moving target. Dealers with regular supply and installations will be able to navigate this challenge for you and help you select the most efficient solar panel you should buy.